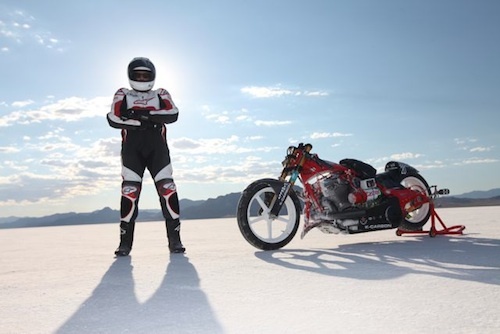 Markus Saegesser has a new World Record Project "naked bullet 2011"
Inspired by the movie "The World Fastest Indian" with Anthony Hopkins in 2006, the passionate motorcycle rider Markus Saegesser has made it his goal to set a speed record on the salt flats in Bonneville in the American state of Utah. In September 2007, Markus Saegesser set four world records and two US records as the first Swiss to do so!! In 2011, he wanted to set a world record as the first rider worldwide with a V2 naked bike to enter into the legendary "201 Mile Club" (323.478 km/h). 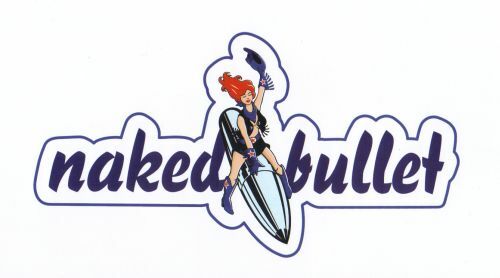 With that, Markus Saegesser would be the fastest driver on a non-streamlined motorcycle worldwide, his "naked bullet," but unfortunately he failed this time! cash TV supported the project from the start, including filming in Bonneville/USA and broadcasted the documentary on Swiss television at October 2, 2011.
cash TV Documentation from the SF archive! 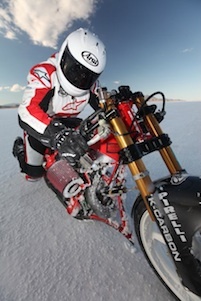 a thrilling documentation about Markus Saegesser and his 2011 Bonneville adventure! At the airport Buochs we went ​​quite comfortably, but in a few weeks it will be serious for the team Markus Saegesser / CCCP on the Bonneville Flats: They want the V2-speed world record! Contact us: we will arrange a high professional speech for your next customer or staff event. All around the thrilling background of Markus Saegesser's Bonneville adventure! After SF1 and ZDF, also 3sat shows again the exciting documentation of the Bonneville world record adventure from 2007! Markus was honored from the city of Kloten! On 30.1.2009, the athletes where honored in the town of Kloten at the Kolping Arena. The award ceremony took place on the ice. Markus was in TV at 'Aeschbacher' Late Nighttalk on SF1, 29.1.2009! The theme of the show was 'extreme' and Markus was the main guest. 4 World- and 4 American Records! achieved by Markus Saegesser, Bonneville Salt Flats, Utah, USA 20.10.07: American Records are official! 26.10.07: World Records are official!